I was talking to a customer yesterday who told me she used our knobs to spruce up a dresser that she bought from Target. It's no surprise that people use our hardware to revamp ordinary furniture. I was reminded of one of my first customers, back in 1993. He owned a hip furniture store in Palo Alto stocked with contemporary imports; a lot of smooth black veneers and clean lines. The cabinet knobs were merely a simple 1" cylinder in a matte silver finish. I was amazed at how he used our knobs to create his own edgy style. He paired each one of the cylinders with one of our large Showstopper knobs to create an asymmetrical design scheme on cabinet doors and drawers. Got the picture? I wish I had one. It was pretty risky but I loved the originality. 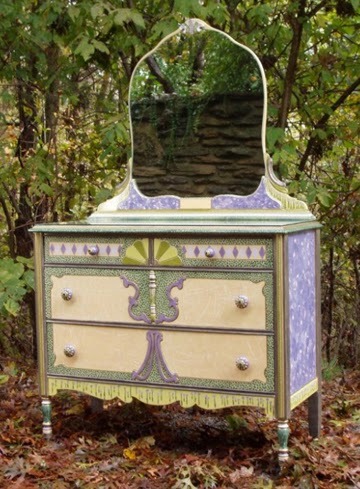 Then there are the artists that make magic with old furniture pieces. Restoration projects can be quite industrious very often requiring stripping, sanding, patching and you name it - all the preparation that's needed to get the surface "paint ready". Granted it's a lot of work. But you can see the results are undeniably rewarding. Here I thought I would share some of the makeovers from some of our professional customers. Love their knob picks! It's hard to imagine what this bedroom dresser looked like in a previous life. Tennessee artist Suzanne Fitch takes a fanciful direction, showing her passion for pattern and detail. Our periwinkle Iris knobs, 1 1/2" and 2" diameter are a perfect choice for this beauty. I can really appreciate the thought that goes into mapping color placement and pattern. 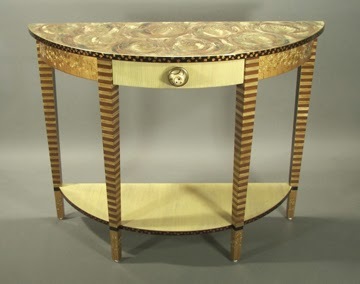 Suzanne did a spectacular job on this console table. Cara and Anne Marie from Twice Lovely in Arizona chose to focus on metallic patinas for this cabinet. Even the hinges have a nice paint finish. They selected our Nu Duo knobs (1 1/2" diameter) from our web specials. The colors are right in sync with the flowers and vines.